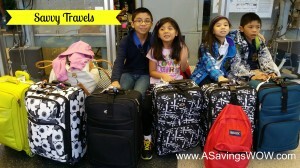 Savvy Travels Twitter Party | A Savings WOW! Savvy Travels Twitter Party 7/8/14 at 8 PM CST – $300 in Prizes! We’ll be chatting about taking summer vacations without breaking the bank. Join us for the #SavvyTravels Twitter party on Tuesday, July 8th from 8 pm to 9 pm CST. RSVP and participate for your chance to win over $300 in prizes! Follow the hosts: @savings, @maritramos, @BeltwayBargain, @MyCrazySavings, and @suitcasetalks! When: Tuesday, July 8th at 8 PM CST. Where: On Twitter in the #SavvyTravels hashtag or on tchat. What: There are several questions they will tweet and discuss. Be sure to use the hash tag #SavvyTravels to be eligible for the prizes. Prizes: We’ll be giving away (1) Hyatt $150 gift card, (3) $50 Target e-gift cards, all courtesy of Savings.com. RSVP: Submit your Twitter handle here to RSVP. Fine Print: Must put your Twitter handle there AND be present at the party in order to win a prize. Use the Twitter hashtag in your responses to questions to be eligible. Must be 18 years or older to win.